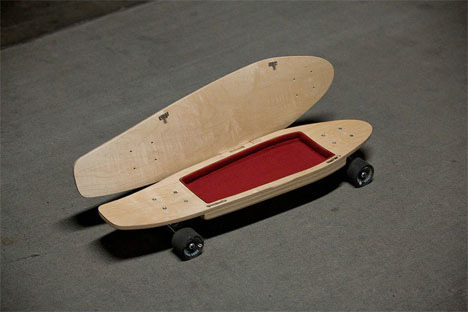 Like skateboarding to work but hate carrying your briefcase along for the ride? 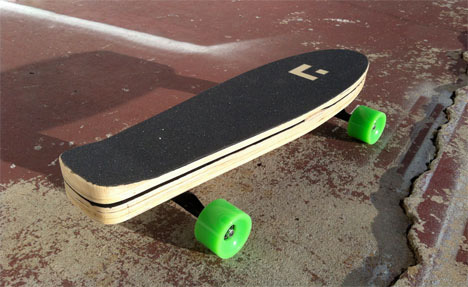 Someone had to invent a solution eventually, and the Briefskate is that solution. Invented by Alexei Novitzky, the Briefskate has a hinged top that opens up to reveal a shock-proof interior that can used to carry all of your important office accessories, including your laptop, phone, important papers, and other everyday necessities. The interior chamber is lined and, honestly, looks a little like a tiny coffin. But it protects your stuff and lets you continue to ride your skateboard to work without the danger of a backpack throwing off your balance. There’s always the risk of a wipeout hurting the precious cargo inside, but that risk also exists when you carry a bag while skating. 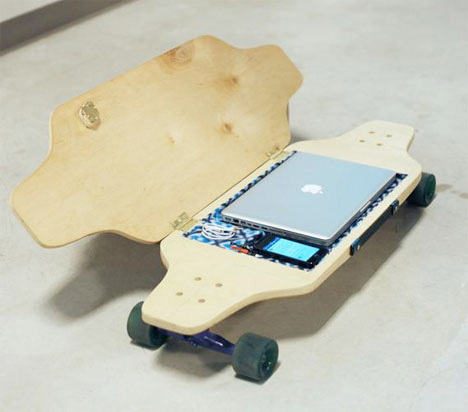 Made in both short and long configurations, the Briefskate might just be the next big thing among tech-savvy business people who also happen to love skateboarding. See more in Mods & Custom or under Transportation. December, 2013.